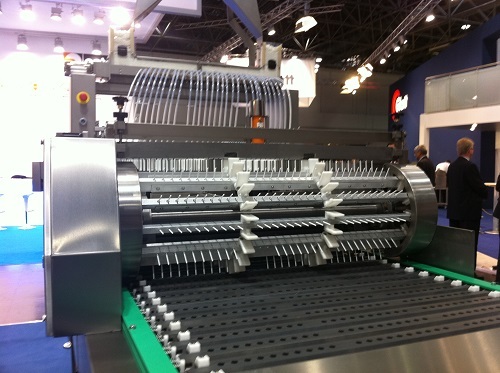 A new generation of the ServoForm™ confectionery depositor range with automatic cleaning, easier operation and reduced maintenance was launched by Baker Perkins at Interpack 2011 (Hall 4 Stand C17). ServoForm™ depositors are the recognized market leader for the production of hard candy and lollipops, and are widely used for soft candies, toffees, caramels and jellies. A fast, automatic cleaning cycle replaces time consuming manual cleaning: washout trays are placed and withdrawn automatically and the washing and flushing cycle is pre-programmed and carried out with no operator intervention. In addition, the machine has been designed to be more hygienic and easier to clean throughout with features such as clip on drain components, and hygienic feet and locks. Cleaning and maintenance have been further reduced by replacing the mechanical transmission for movement of the head and depositing pumps with servo-controlled electric rod actuators. The infinitely variable motion control these provide enables an optimized movement profile to be created and then stored using the touch screen HMI. Synchronisation is achieved electronically, eliminating cross-shafts and associated components, leading to improved hygiene and simpler maintenance. Start-up time has been reduced by the introduction of on-the-run adjustment for mould lift under the depositor head. This adjustment helps to minimize tailing and waste and previously required the machine to be stopped. Companies producing a variety of products on a single line will now see a reduction in the time taken to achieve full production. As before, set up of the machine is via a recipe control system on the HMI: at the touch of a button all the major variables are adjusted to pre-set values. The new generation ServoForm™ range is modular, with each variant comprising one or more depositor heads, product specific mould sets, a cooling tunnel and – for lollipops – a stick placer. The modular concept covers the full range of ServoForm™ depositors for candy and lollipops. It includes the ServoForm™ Duo producing hard candy and lollipops on a single line; the Universal for both hard and soft candies; and the two or three headed Gemini for high outputs and unique layered products. 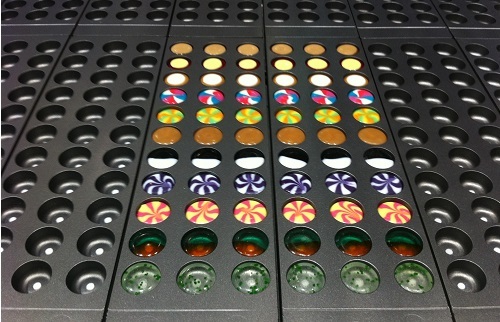 The ServoForm™ depositor produces a wide range of high-quality, multi-colour and multi-component hard and soft candy products, including lollipops, in one, two, three and four colours, in stripes, layers or random patterns. The machine can handle a range of different textures enabling multi-component products with one or two centre-fills to be made.